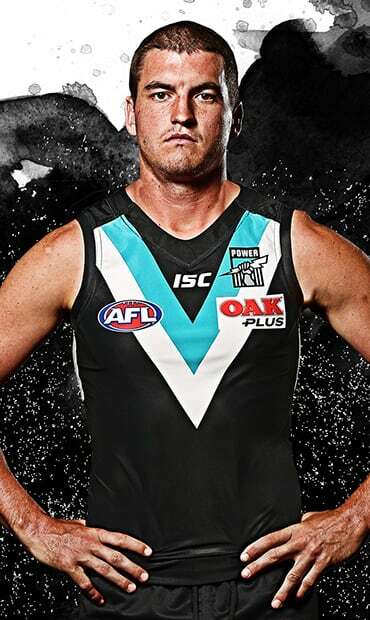 FORMER Brisbane Lions captain Tom Rockliff is officially a Port Adelaide player after the Queensland club chose not to match his free agency offer. Rockliff, 27, was also hotly pursued by Carlton, with the Blues rolling out club greats Stephen Kernahan and Chris Judd in a meeting with the All Australian midfielder in an attempt to sway him to move to Ikon Park. But Rockliff informed Carlton last week that he had opted to join Port, and the Power made it official on Wednesday that they had secured the ball-magnet. It's believed Rockliff has joined the Power on a four-year deal worth about $650,000 a season. Rockliff was a restricted free agent, so the Lions could have matched the South Australian club's offer. But they will accept a compensation pick instead, a selection at the end of the first round, leaving the Lions with picks Nos.18 and 19 in the NAB AFL Draft. Rockliff considered Carlton's offer, but eventually settled on Port Adelaide for the security of a long-term deal and opportunity to chase finals success. "I think security in the end for me was a big factor," Rockliff told 3AW. "A number of factors went into it. Obviously with a young family, I've got to think about them as much as you do yourself. "Obviously it's a very good football club. Port Adelaide has so much history and I think they're very close to success and hopefully I can fit into that and drive for September action. "I just think that Port Adelaide is a really good fit for me, the role they want me to play is a good fit and I think they're not too far away." "I feel like I can play multiple positions and I think they see that as well," Rockliff said. "I feel like I'm quite dangerous inside 50 and probably haven't had the amount of time I would've liked over the years in the forward line." Lions coach Chris Fagan, when asked last Wednesday about the likelihood of Rockliff leaving the Gabba, said: "It's not the end of the world." "You do get a compensation pick if he does go and that will be a good player for sure, because it'll be somewhere in the top 20. So it could be good for Tom and it could be good for the footy club." Rockliff was put up for trade last year after the Lions' tumultuous 2016 season, but there was little genuine interest from rival clubs. Rockliff lost the Lions captaincy when he returned for 2017 pre-season training, but after being appointed vice-captain to new skipper Dayne Beams he produced an outstanding season. The former Murray Bushranger averaged 24 possessions and 6.4 clearances a game (equal ninth in the AFL) in 2017 to finish third in the Lions' best and fairest award. His teammates also voted him the club's Players' Player of the Year. Rockliff played 154 games for the Lions from 2009-17. He won the 2011 and 2014 best and fairest awards, and in the latter season was named an All Australian. • Trade winds: Trouble for Dons' triple play?